Heritagization? Att göra anspråk på arv, genom att tolka och vinkla det förflutna: kulturarv, familjehistoria, nationens historia. Fenomenet inbegriper oss alla, på mikro- och makronivå. Museer vårdar sina samlingar och gör sina urval. Politiska partier värnar sin version om till exempel ”nationens kulturarv” och vill kanske upprätta en kulturell kanon. Men också på individnivå arbetar vi medvetet eller omedvetet på vår egen historia, tolkar och omtolkar den. I det här projektet fokuserar en grupp svenska och vitryska konstnärer på olika former av den processen, också genom att visa på alternativa former av Heritagization, individuellt eller kollektivt, genom de egna konstnärskapen eller aktiviteter i det offentliga rummet. Under utställningsperioden är publiken välkommen att delta i samtalet och bidra med egna synpunkter och erfarenheter. At the Gallery 54 one of the groups whose collaborative effort focuses on questions of heritagization will present their investigations and works. They will meet a Gothenburg audience during 3 days of the exhibition. An exhibition as a meeting point means that you are most welcome to meet the participants during the gallery opening hours to discuss visions and thoughts within the topic. Heritage making – the creation and recreation of cultural and historical meaning and identity – is done by different actors and at different levels, from institutions, museums, their visitors, to common people. In the collective project Heritagization, the group focuses on different forms of heritagization that emerge parallel with – or in conflict with – official and authorized forms of heritage making. 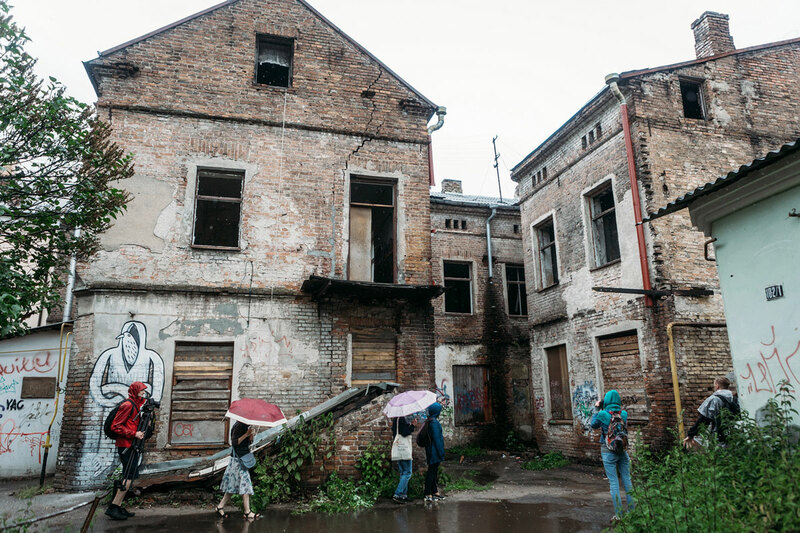 In particular, the group is interested in highlighting, enacting and performing alternative processes of heritage-making in individual and collective ways, through art practice and activism in urban public spaces. The project is composed of different parts that communicate with each other to explore how art and activism can make heritage in Belarus and Sweden. The work of the group is based on academic research, artistic-based research and performative methodologies. This catalogue is work in progress, where we propose to discuss the cases connected with the topic of Heritagization. Heritagization – heritage-making, the creation and re-creation of cultural, historical meaning, and identity – is done by different actors and at different levels, from institutions, museums, their visitors, to common people, and artists. In our collective project, we focus on different forms of heritagization that emerge parallel and/or are in conflict with official and authorized forms of heritage making. In particular, we are interested in highlighting, enacting and performing alternative processes of heritage-making collectively, through art practice and activism in urban public spaces. The project is composed of different parts that dialogue and build on one another to explore how art and activism can make or reflect on heritage. We also plan to analyse the situation in Belarus and Sweden and will try to search for any similarities, patterns, or differences in our future work. What do you think the future art history shall include? Do you want to be part of it? I need your help for a piece of art, please read and share with your artist friends! I am working with a series of pieces based on the idea of my self as an artist prepper. To use my artistic work to secure the potential dark future we are facing. What do I need as a person to survive and how can I use my present work to help out in different future scenarios and at the same time express the obvious damage we all participate in. One thing I realized when I been working on this subject is that it would be really hard to stand the thought of being without art and that everything good that is created this far will disappear when large part of the planet will end up under water. I am now going to be part of an exhibition/event at Galleri 54 in Gothenburg in the middle of March dealing with the concept of Heritagization. We are a group of “artist workers” from Belarus and Sweden that in different ways are investigating the idea of the future heritage of art and artists. I like to preserve the art history, not only the well known but the art that in someway are important to me and my surroundings (friends, family and colleagues). I am planning to collect artist books, vacuum pack them and pile them on a floatable “Pallet”. I now need your help to collect all these artist books. What is important to save for the future? Are you willing to give away one of your own books? I would be delighted and sooo thankful if you will help me with this piece, if there was a budget I would totally buy from you guys, but at the moment I don’t have that possibility. At a meeting in Brest, Belarus in September 2018, I became fond of the idea of looking at myself as a research-rabbit. I proposed to our research group to come up with questions about what artists are useful (a utility) for. The answers could program me to act out in that way. It was my response to the parasite-tax in Belarus, which forbids artists to not be useful for society. The idea of the rabbit came from wondering a lot about my own contribution and challenge in the project. I saw the journey to Brest as a research trip without knowing what to research…more than looking for the artist’s role in a changing society, I took a bit of reality from my life and my fellow artist colleagues. Well I felt like a rabbit, and I also felt a bit used to be honest. When reading a bit more about the Belarusian government’s proposal about the parasite-tax, I wondered if I should not try out another more-parasitic type of being? A cockroach is a parasite – the cockroach is not useful and does not contribute to society except for themselves and a small circle of friends and family. A cockroach – inspired by Kafka – would fit well into my artistic research perhaps. As an artist, I spend my time doing something for no reason. I am a junky for new challenges and circumstances – so here I am! Working again and making a complex meta-perspective on who is leeching off of whom and for what and what for? For me it comes down to an altered Shakespearean question – to do or not to do? And what does art do anyway? How could the rabbit or cockroach ask questions to society? The cockroach ask the questions in a negative manner - What do you hate most of all? Is there a place you wish would disappear? The rabbit has a bit more constructive manner (at least for heritage-making) – Is there a place you want to save for the future? Is there an object you want to keep for the children in the future? Let us see what comes out of this performance. The future now is behind us, as is argued by Zygmunt Bauman in his final book Retrotopia, and he means that we love to look at the time that has passed. So the year…2018 is the year of “Cultural Heritage in the EU” – I am asking what we can do in order to keep this making of heritagization and keep some space and hope about the future? Can we re-future our situation? MAKE RE-FUTURISM MAYBE…..how to re-future our space? And to do that as an anomaly, to go against this idea of ‘building’ identity through history…..how can we do that? I love to ask these question as an artist. To go against what the people want the rabbit to do and instead be the cockroach – the uninvited, the not wanted – as a refusing to be useful as an artist. Belarus is a country in transition, that’s why some of the processes are still ongoing, among them are such things as heritage. It is not something stable but still a process of discussion by different groups, authorities, individuals and artists. "The Nailepshy Bok" is one of the examples when the artist group VEHA is trying to work with personal stories and also collective memories through archival photography. The collection represent the theme of photography as a social ritual, most of them were taken in the postwar period up to the 1960s on the territory of present Belarus. Wall carpets in the photos are perceived as the necessity of representing family life and special events. The photos are made not in studios but in everyday life, but all people are specially ready for this occasion and position themselves on the photo from their ‘best side”. Photos collected by the Veha group become not a personal or family story but a collective memory full of signs, rituals, and social history. What is the role for the artist in the process of heritage making? How artists can help to decide what is the heritage? Can the artist became a historian or collector? Are the old family photos with handmade carpets marks of local identity? What stories we can read from the old family photos? Do you have some special tradition in your city region regarding family photos? The photo project "The Nailepshy Bok / The Best Side" by Belarusian group VEHA. 1950-1952, Pygachy village, Minsk region, archive of Dzmitry Syarebranikay. 1940-1959th, Navaselki village, Hrodna region, Family of Francichka Martylya. As part of the collective project on different forms of heritage-making, Elina Vidarsson studies and compares monuments in central public spaces of Gothenburg. She is specifically interested in how urban public spaces are formed and how this affects its inhabitants. Through her work - Within and Without - Elina Vidarsson tries to understand if and, in that case, how we as observers of public monuments shape and construct their meaning at the same time as they shapes and constructs us. Högberg, A. 2012. The Voice of the Authorized Heritage Discourse. Current Swedish Archaeology 2012 (20):131–167.